The research uncovers that the IoT Platform market is accelerating in 2018 as more and more businesses prioritize their transformation into IoT data-driven companies. Spending on IoT Platform-related software and services for connected business solutions is forecasted to grow at a rate of 39% per year until 2023. The vendor landscape remains fragmented but first winners are emerging. Report Insight: How customers select their IoT Platforms? Among other things, the report highlights several examples of how customers select their IoT platforms. 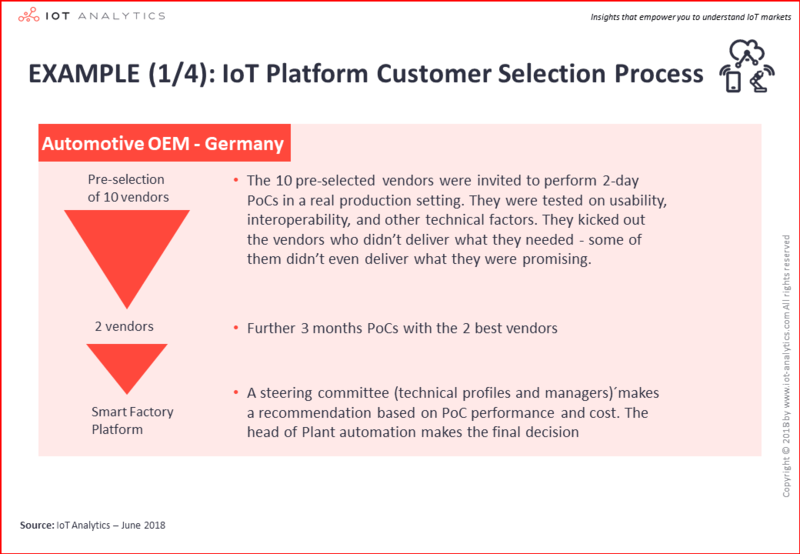 One example, an automotive OEM in Germany pre-selected ten IoT platform vendors and invited them to perform 2-day Proof-of-Concepts in a real production setting. Vendors were assessed using a number of testing criteria in connecting equipment on the factory floor such as infrastructure, network, IoT, analytics, managed services, security, usability, and partner ecosystem (which each may have up to 10 weighted sub-criteria). Following this, two of the best vendors were selected for 3-month PoCs and were further ranked on their capabilities. Finally, recommendations by the IoT team involved in the PoCs were made to the steering committee and the head of plant automation made the final decision. For more information on this case study and for other similar examples please click here. The IoT Platforms report forecasts a compound annual growth rate (CAGR) for IoT Platforms of 39% over the time frame of 2018-2023, with annual spending surpassing US$22 Billion by 2023. These numbers are based on the IoT Platforms related revenue of the leading companies in the field, across 11 industry segments (Agriculture, Connected Buildings, Connected Car, Energy, Health, Manufacturing, Public services, Retail, Smart supply chain, Transportation, and Other). The market is broken down into 7 regions (Asia, Europe, North America, MEA, South America, Oceania, Rest of World), 5 platform types (cloud platforms, application enablement platforms, device management platforms, connectivity platforms, advanced analytics platforms), 4 deployment types (on-premise, hosted private cloud, hybrid cloud, public cloud), and 2 revenue types (platform software sales vs services sales). In developing the 193-page report, the analyst team at IoT Analytics studied over 450 technology companies that offer IoT platform technology elements and reviewed 1,600 implemented enterprise IoT platform projects. Further input to the report included 20 completed surveys from leading IoT platform providers, 27 completed surveys from IoT platform end-users, 20+ industry interviews and numerous expert discussions at 10+ leading IoT conferences. The report analyzes the competitive landscape of the IoT platforms market estimating the 2017 market share of leading vendors. Microsoft and PTC are identified as the leading vendors in terms of market share in their respective platform types, cloud and AEP. The role of certain industries (e.g., Telecommunications, Industrial Automation, System Integrators), open source vendors/communities, market funding/investment activity and M&A deals are also described. 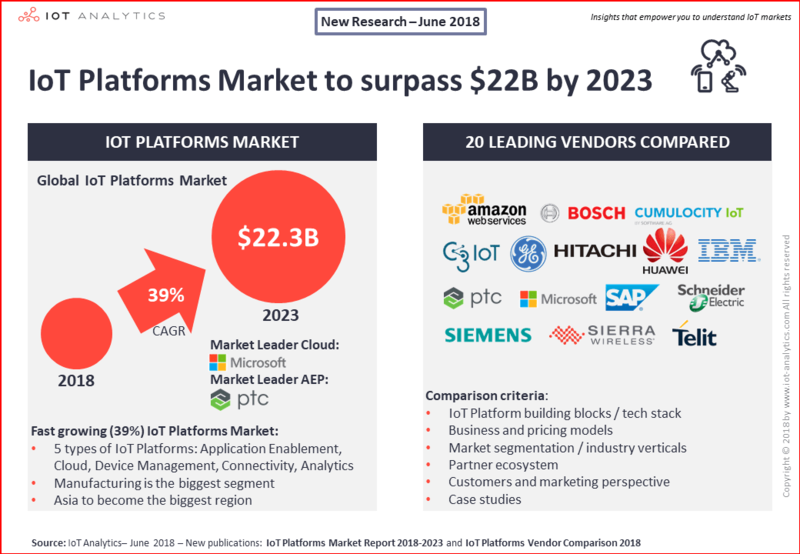 IoT platform business models are examined in the report describing selected market strategies, the sales approach, how to bring an IoT platform to market, platform collaboration and the differences between closed and open platforms. The IoT platform report also calls out 4 major industry trends as well as various challenges, adoption barriers for technology providers, the needs and perspective of customers, and lists over 30 use cases enabled by IoT platforms. To supplement the market report and to help end-users decide which platform to choose from, IoT Analytics is simultaneously releasing an IoT Platforms Vendor Comparison 2018. The 450-page document provides an in-depth comparison of 21 popular IoT Platforms. The document focusses on 6 major customer decision criteria: IoT Platform Building Blocks, Business & Pricing, Market Segmentation, Partner Ecosystem, Customers & Marketing, Case Studies. These decision criteria are further broken down into 23 sub-topics. Which building blocks are included in the different IoT Platforms offering? Which pricing options do the platform vendors offer? Which market segments do they cater to? In which regions are the vendors mainly active? How are the partner ecosystems structured? Who are the main customers of the platforms and what are some customers’ opinions on strengths and weaknesses? On a detailed level, some of the dimensions analysed include Application Enablement and Device Management building blocks by vendor, IoT application marketplace sizes by vendor or supported communication standards by vendor. The majority of IoT Platform vendors cover 60-100% of all analysed platform building blocks. The IoT Analytics IoT Platform Vendor Comparison also uncovers that most platforms have rather strong partner ecosystems. 16 of 21 analyzed companies have their own partner program and 20 of those are also involved in IoT consortia and standardization organizations. The highest number of those partnerships are with system integrators (30%). The List of analysed IoT Platform Vendors includes: Accenture, ADAMOS, Amazon Web Services, Bosch, C3 IoT, Device Insight, GE, Hitachi, Huawei, IBM, Kaa IoT, Microsoft, Mnubo, PTC, SAP, Schneider Electric, Seluxit, Siemens, Sierra Wireless, Software AG, Telit. The information put together in the IoT Platform Vendor Comparison was mainly collected through surveys that were filled out by platform vendors themselves. The information was enhanced with information from 25 interviews (45-60 mins) with: IoT Platform companies, members of IoT communities, system integrators and IoT Platform customers. Furthermore, IoT Analytics conducted extensive desktop research and screened 300+ relevant presentations and websites. IoT Analytics compiled a market model, upon which revenue estimations for all IoT Platforms included in the report are based. The Market Report is available to download HERE and the Vendor Comparison is available to download HERE. Note: There is a significant discount if both reports are purchased together. A sample of the market report can be downloaded HERE and the vendor comparison HERE. IoT Analytics is the leading provider of market insights & competitive intelligence for the Internet of Things (IoT), M2M, and Industry 4.0. The specialized data-driven research firm helps more than 40,000 Internet of Things decision-makers understand IoT markets every month. IoT Analytics tracks important data around the IoT ecosystem such as M&A activity, Startup funding, company projects, use cases and latest developments. Product offerings include in-depth market reports, technical whitepapers, sponsored research, regular newsletter, as well as Go2Market and consulting services. As a research pioneer, IoT Analytics combines traditional methods of market research such as interviews and surveys with state-of-the art web-mining tools to generate high-caliber insights. IoT Analytics is headquartered in Hamburg, Germany. Accenture, Actility, Aeris, Alibaba, Amazon, AT&T, Ayla Networks, Bosch, C3 IoT, Carriots, Cisco Jasper, Davra, Ericsson, Evrythng, Fujitsu, GE, Gemalto, Google, Huawei, IBM, Kore Wireless, Microsoft, Mnubo, myDevices, Nokia, Oracle, PTC, Relayr, Salesforce, Schneider Electric, SAP, Siemens, Sierra Wireless, Software AG, TCS, Telit, Tencent, Uptake, Verizon. The post Microsoft and PTC named leading IoT Platform vendors for Cloud and AEP, respectively, as growth in the IoT Platforms Market accelerates to 39% appeared first on IoT Analytics.